The rivers fired back up this week with the warming trend. Water temperatures in all rivers in the area rose well into the 60s early this week before the cold. The swamp is fired back up too. Saltwater was hit-and-miss for most, but should improve with lower tides. Full Moon is Dec. 17. To monitor all the Georgia river levels, visit the USGS website. 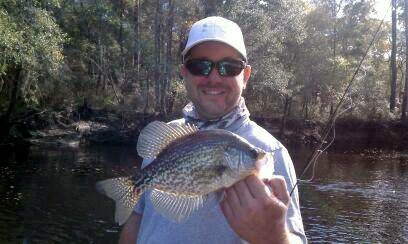 Altamaha River – A Waycross angler fishing in the Altamaha Park area of the river over the weekend whacked the crappie. He caught his slabs on minnows. Anglers fishing in the lower Wayne County portion of the river caught some nice bluegills, redbreasts and a huge crappie on Tuesday. They brought home 10 beauties and threw back about the same amount. They used 1/8-oz. black-yellow and crawfish Satilla Spin spinnerbaits to make their catches. Connie at Jaycee Landing Bait and Tackle reported that the crappie were still biting well for both minnow and jig fishermen in the Jesup area, . The river level was 4.8 feet and cresting at the Baxley gage, and 6.7 feet and rising at the Doctortown gage on Dec. 10. Satilla River – Ed Zmarzly and Justin Bythwood fished the area around the Blackshear Bridge (Hwy 84) on Friday and caught a really nice mess of bluegills, redbreasts and crappie. They caught all of them on Satilla Spins, and the 1/8-oz. version was most effective. They caught a few early on black-yellow, but the crawfish out produced other colors, and they both switched to that color by early afternoon. Their total catch was 30 fish, and the crappie were both about 12 inches, the bluegills were up to 10 inches, and the redbreasts were up to 9 inches long. I took my son Timothy to the Satilla on Monday afternoon for a few hours. We mostly poked around on sandbars, but we did fish about an hour and did pretty well. We ended up with three redbreasts (the biggest, a 9-incher, ate a crawfish 1/8oz. Satilla Spin), three huge bluegills to 10-inches (ate worms fished on bottom), a catfish (on worms), and a 10-inch crappie (ate a black-yellow Satilla Spin). The river was perfect for getting around while the level was around 7 feet this week, and the water was surprisingly clear. Michael Winge of Winge’s Bait and Tackle in Waycross said that the redbreast bite has been outstanding this week with the warming trend. A panfish bite this good at this time of year is rare, but he said that with the high population due to summer rains, the catches have remained outstanding. Two anglers from South Carolina fished from canoes in the FFA Camp area of the river on Saturday. They kept 26 redbreasts they said were the biggest they had ever caught. Minnows and jigs have been fooling crappie in all sections of the river. Michael expects the cooler temperatures to slow the redbreast bite but improve the crappie bite. The river level at the Waycross gage was 6.7 feet and falling and at the Atkinson gage was 6.3 feet and falling on Dec. 10. St. Marys River – Redbreasts were caught on the upper river by anglers pitching crickets. Catfish were caught in the middle river by those fishing worms and shrimp on the bottom. Quite a few crappie were caught by anglers fishing minnows in the slack-water areas. Most of the crappie were on the small side. The river level at the MacClenny gage was 2.7 feet and rising on Dec. 10. Local Ponds – An angler reported catching a nice mess of crappie on minnows from the Laura Walker State Park Lake. Michael Winge of Winge’s Bait and Tackle said that other Waycross area ponds have produced some excellent catches of crappie again this week. On the warmer days, lots of bream were also reported. Crickets produced the better bluegill catches. Okefenokee Swamp – The number of anglers reported has been very low, but those who went did well. Fliers were again the best bite, as is to be expected all winter. Yellow, orange, and pink Okefenokee Swamp Sallies produced the best. Saltwater (Georgia Coast) – I received several good reports, but overall, the big tides slowed the catching this week. A group fishing Crooked River on Saturday caught a few sheepshead, a ton of yellowtails and about a dozen whiting on shrimp fished on the bottom. Michael Winge reported local anglers catching trout, redfish, and flounder in the Brunswick area. He also said the whiting picked up this week. Mike and Trish Wooten of St. Simons Bait & Tackle said that the number of anglers during the big tides were low this weekend, but there were some sheepshead, trout, and whiting caught from the pier. They said most of the anglers fishing from boats in the creeks around the island reported catching from 6 to 25 trout per boat. Christmas Gift Ideas for Anglers: Crooked River State Park cabin/guide packages are perfect for the saltwater enthusiasts on your list. The package includes 2 nights lodging in a cottage and a 2 1/2-hour guide trip. Call the park at (912) 882-5256 for more information. High quality coolers are expensive, but they are built well, are tough, and keep ice a LONG time. High quality knives are always a great gift for any sportsman, whether a pocket or a hunting knife. Previous suggestions include: Camping gear (wouldn’t a new tent that does not leak be a good investment?) and insulated coveralls. There is nothing like staying warm on a cold day. A quality pair of coveralls will allow you to focus on the fishing and not how cold it is outside.